People always ask us if we rent a bike when we go on trips. 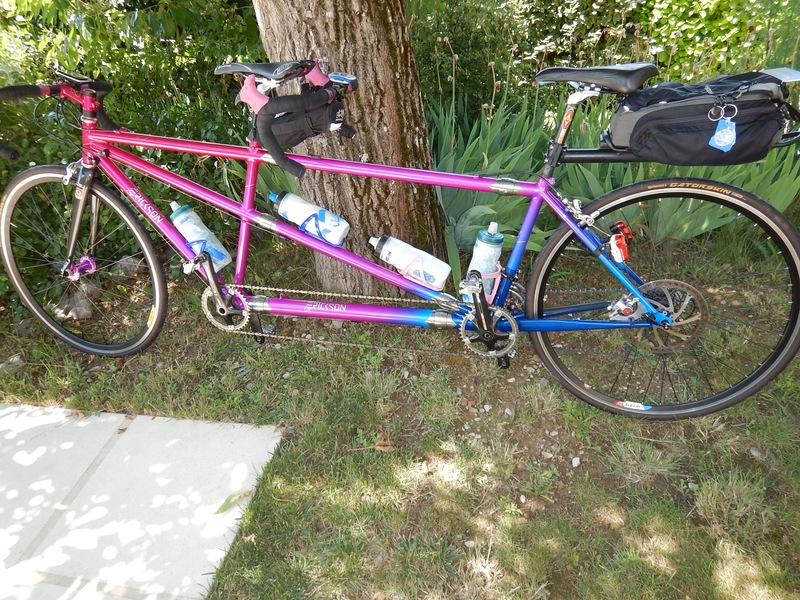 We answer that we take our tandem with us. This usually is met with surprise and shock and spawns questions about how we ship it and how much it costs. Before the airlines started charging money for more than one suitcase per person we didn’t pay anything extra at all! But the bike needs 2 suitcases, so we have to pay for the one which contains our clothes and everything else. 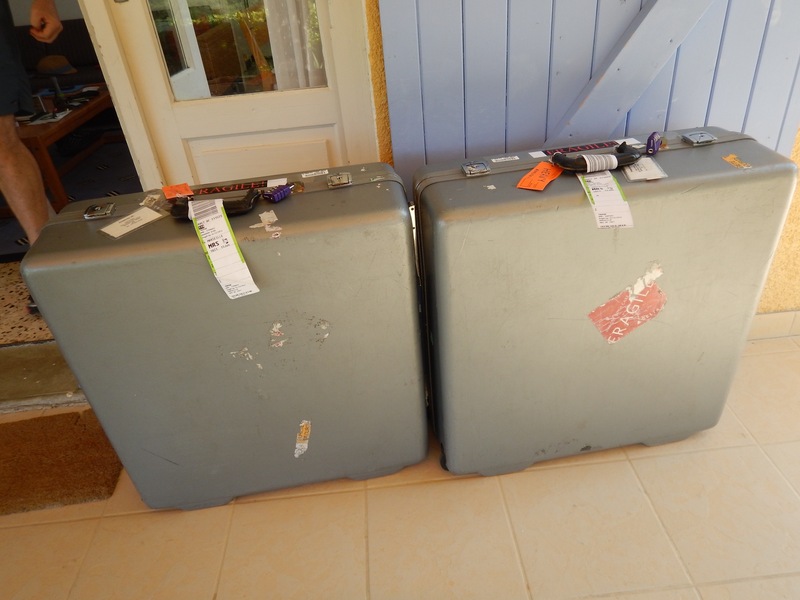 These cases fit within the airline standard maximum size (62″ combined – so that’s 26″x26″x10″). They make the weight limit of 50 pounds when fully packed (with our cycling shoes and the rear rack/case too). Here is what it looks like when we open the suitcases. You can begin to see parts of the bike which has been taken apart and carefully wrapped in padded casing to protect all of the surfaces. It’s all about the couplers. The S and S Machine Bicycle Torque Couplings make this all possible! It was a brilliant invention that allows so many of us to travel with our bikes. But it’ll cost you – the couplers added $1500 to the cost of the bike and the special suitcases cost another 500 dollars. 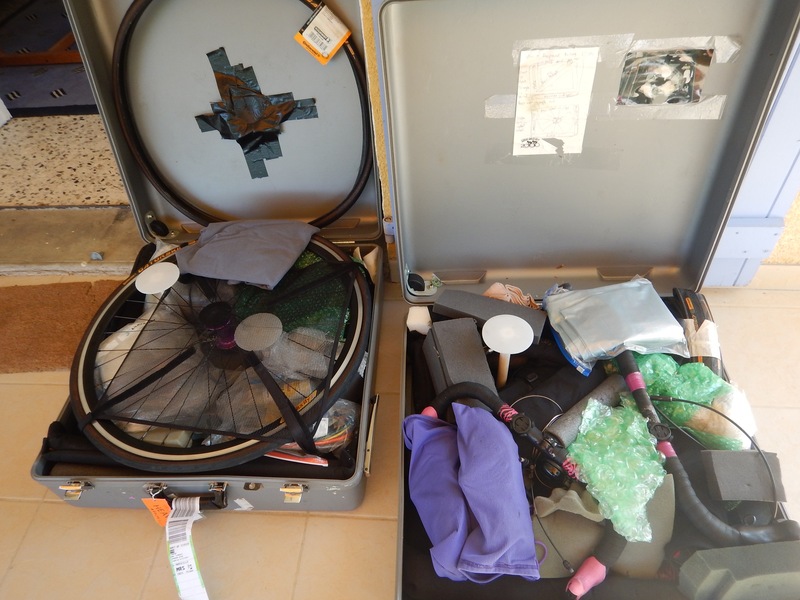 For fifteen years, this bike has flown as normal standard luggage (we say sporting goods equipment if anyone at baggage check asks what it is) without that nasty bike fee or any oversize or overweight costs. By my rough estimate this well traveled and well-loved tandem has flown close to 20 times, so we have more than amortized the cost of the extra investment! If your bike isn’t coupled (even if it’s a single bike) and can’t fly in an allowable size suitcase, it’ll cost you a fee. Depending on the airline it can end up costing as much as an additional ticket – so beware! Voila! 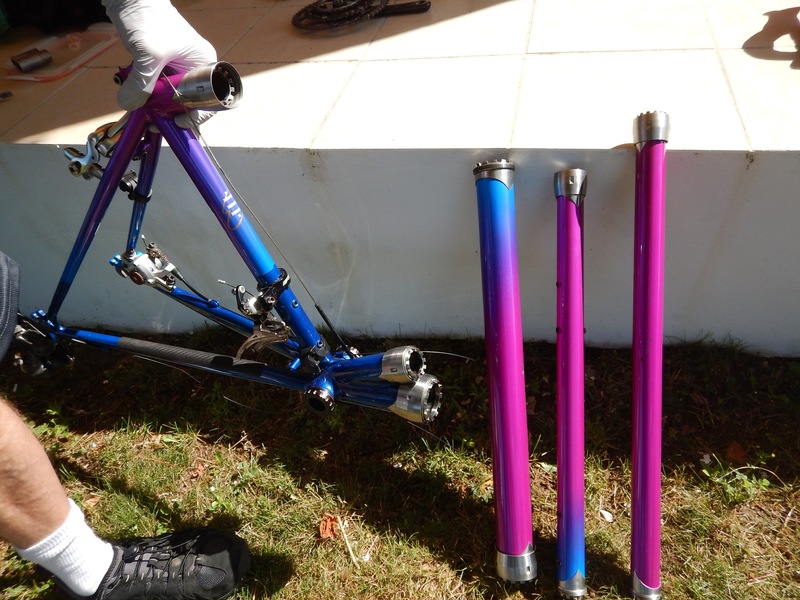 The tandem frame is all together! 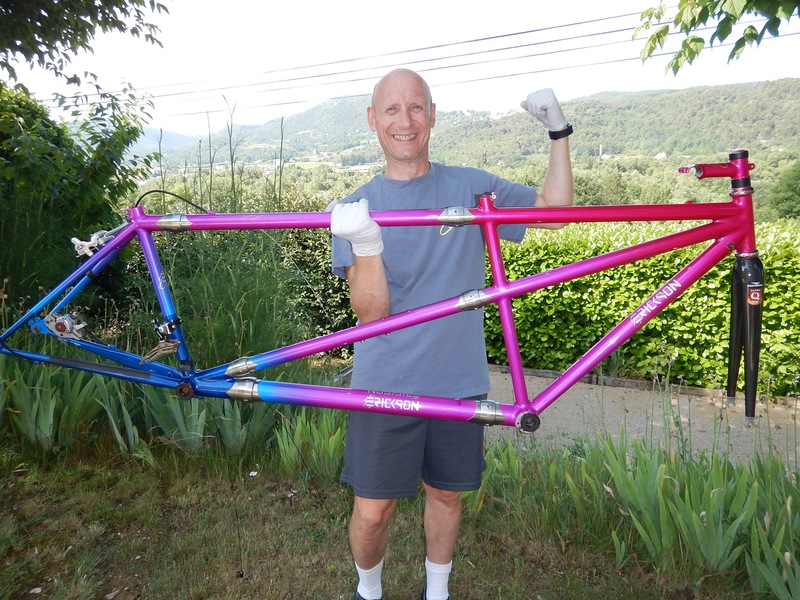 And finally the rest of the tandem is assembled and ready to go on its first adventure. Coming up next, the bike is built. Will Eve be able to ride, or is Roger riding solo? Looks great Roger!! We were hoping for an update on Eve. I feel her pain. After GTR 2009 I suffered a grade 3 ankle sprain as well.Let us know!! How do you control two rear brakes? Hi Jerry: The disk brake is on a bar-end shifter and the rim brake is on the regular brake lever.